How Rare are Gold Nuggets? We all know that gold itself is a rare commodity. The fact that the metal itself is now valued at well over $1000 per ounce explains the overall rarity of gold compared to many more common metals. All gold comes from the earth. All those refined bars, rounds, jewelry, historical artifacts, gold coins; it was all mined out of the ground at some point in history, and it has been valued by ancient civilizations for thousands of years. However, the natural beauty of gold nuggets and specimens in its natural form has really only been appreciated by most people for a few decades now. Well over 99% of all the gold that has been produced throughout history has been melted and refined. 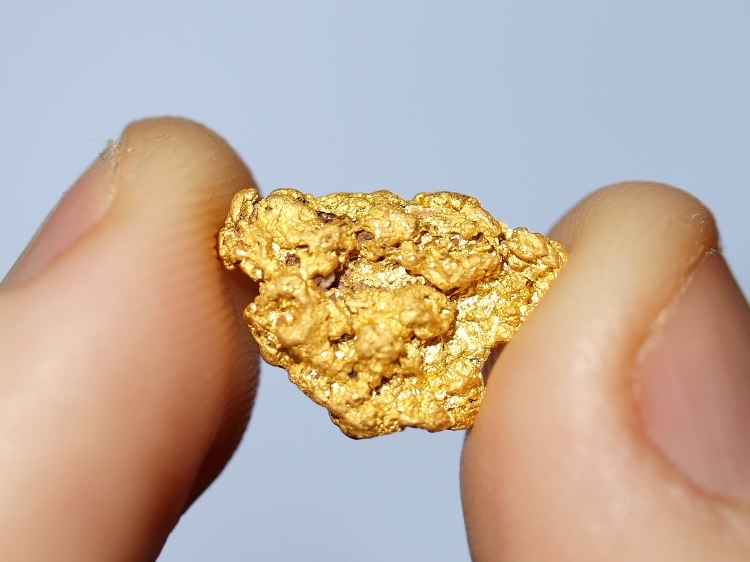 Only a tiny fraction of the gold nuggets that have been found throughout history exist today. That may seem hard to believe at first, but think about it… all of the gold that was mined by the Egyptians, Incas, Aztecs, Mayans; nearly ALL of it was melted down and used for art, jewelry, and currency. Just about every ancient civilization in history has valued gold, but almost never in its natural form. This trend of melting down gold continued on through the gold rushes in Australia and the United States. All through the 1800s, millions of ounces of gold were sent off to be refined. A countless number of gold nuggets were melted down and turned into bullion. This continued well into the 1900s as well. You might think that the current interest in collecting natural gold has slowed this trend, and it certainly has to some extent. However, there are still many large mining companies that simply do not want to bother with going to the effort of marketing their gold to mineral collectors, and are still refining their gold! The reason for this is actually quite simple. Refined gold bullion is easy to sell and is actively traded on the open market. Regardless of the quantity, there are always buyers for gold bullion. Natural nuggets on the other hand require marketing. Each individual piece must be sold to a collector to get a premium for them. Large multimillion dollar mining operations just don’t bother with it. Their time is better spent extracting large quantities of gold than to market their finds to collectors. It is also very important to understand that only a very small fraction of the gold that is mined today actually comes in the form of a gold nugget. The vast majority of the gold mined today is extracted from hard rock. Ore is crushed and processed to extract the valuable metals from the rock, but there are no nuggets being produced at these mines. There are millions of ounces of gold produced from many large mines without a single nugget to show for it. While the large mining companies may not have any particular interest in gold nuggets for their collectibility, small-scale miners certainly do. Just ask any prospector who has spent any time prospecting for gold and they will tell you that gold nuggets are rare and hard to find. Even if you are in an area known to have gold nuggets, actually finding one to add to your collection is no small task. So why are gold nuggets so hard to find? Most gold is small. In most areas, gold dust is what is commonly found. These small bits of gold are often so small that it would take thousands and thousands of pieces to accumulate to even a few dollars’ worth of gold. Even successful placer miners who find many ounces of gold each year often do not find gold nuggets. All of their gold is in the form of small gold dust and flakes. Gold nuggets are rare and just don’t occur in great numbers. Even in the very rich gold-bearing areas, actually finding a nugget is no small task. Again, this is the reason that gold has such a high value today, and nuggets are even rarer. If it were common, it wouldn’t be worth so darn much money! Another reason that gold nuggets are exceptionally hard to find is the fact that miners and prospectors have been searching for them for so long now and the richest deposits have been depleted. In the western United States for example, nearly every creek and river has been searched for gold. Place where gold was found in any quantity was generally mined very hard. Thousands of miners would converge on an area and search every creek, river, and gulch looking for gold. While these areas will still produce gold today, and the occasional nugget can still be found, the early miners definitely found the “cream of the crop.” And what happened to the gold nuggets that they found? They were sent off to be refined. So between the fact that most of the easy to find gold has already been discovered by miners in centuries past, and the fact that nearly all of that gold was melted down, it is easy to see why gold nuggets and so rare today. It has only been in the past few decades that natural gold has been valued by a large number of collectors for more than their gold content alone. Fortunately, natural gold nuggets and specimens are finally starting to be appreciated for more than just their melt value. Mineral collectors now understand that gold nuggets are just like any other rare mineral or gemstone. Just like a diamond, they are not all created equal. Some are better than others; their quality can vary and influence their value. Commercial grade diamonds that are used for industrial use are obviously valued differently than the jewelry grade diamonds, and an exceptional gold nuggets are now valued differently than tiny gold pieces that is crushed and extracted from hard rock. Next: This Nevada Gold Mine Produces Amazing Crystalline Gold Nuggets!